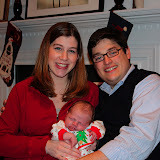 Ben's first christmas was a mellow event. The Bentley clan was in town to celebrate. Realizing we didn't know when Ben was really going to arrive, we did our full Christmas celebration a few weeks back. Check out a few pics if you're interested. Merry Christmas, Nick, Kris, and Benjamin! !